Today was the day! First checking of our newly established bee hive after we received 3 lbs packaged bees about a week ago. What we are looking for is eggs and larvae to find out whether queen bee is alive and doing her job. In case she is not (alive or laying), we need to order a new queen immediately. Obviously this is a time sensitive issue, which is why it is recommended to do at about 5-7 days after hive installation. Apparently, when a hive looses its queen, the working bees will start laying eggs to populate the place. However, these reproductively incomplete girlies can only lay drones (male bees), which don't do any work (not even bringing the trash out! ), which is why the colony will fail. Also, only the queen has the instinct of mating right (yes the first 36 years of my life I was NOT a queen bee) and directing a colony. In short, if my queen is dead or incapable, I better rush and get a new one, which is why the initial hive-check after installing a packaged hive is due after about a week. That should be enough time to for a plan Bee. We have Italian bees, which are somewhat gentle but not as docile as the Carniolans. The reason we chose the Italians was pure patriotism; everthing Italian is superior! Duh! No, the main reason was availability. We did not find a NUC of Carnis, so we got the Italians. So far I find them pretty docile. While one may argue we could have requeened (killing the old to bring in a new queen) with a Carni-queen right after delivery, we chose not to do that as to not upset the colony. Personally, I simply don't approve of killing ANYTHING which is why I will not kill my queen just to be able to put another one in while running the risk that the colony may reject her or such. Also, I am rejecting the entire disposable thinking in general, and requeening for no apparent reason simply seemed wrong. Anywho, let's get the apiarist regalia out. Yes, I know, tres chic! Where is my Louis Vuitton purse to go with this outfit!? Sorry, don't know how to do the accents on my keyboard. Aurelia and Roberto were not home, so this was the perfect time. 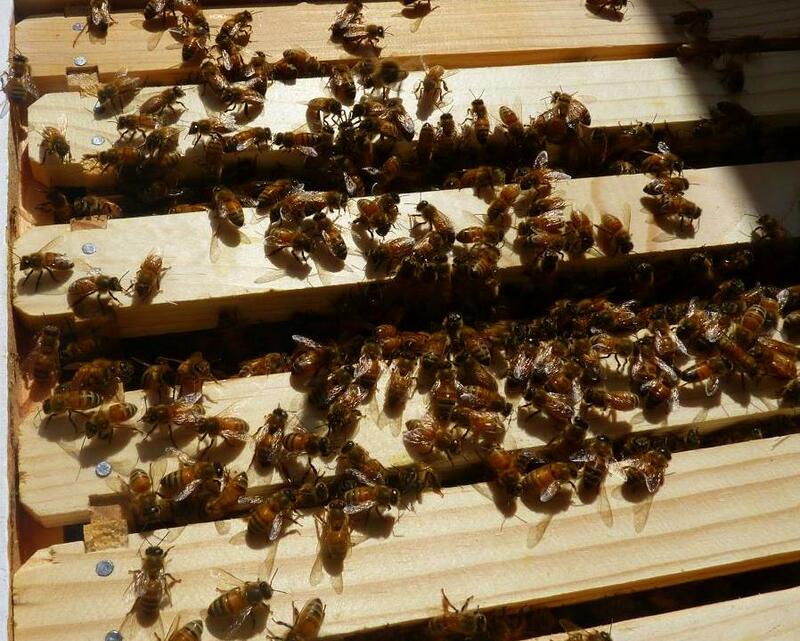 It is recommended to open the hive in the late afternoon, when most of the ladies will be out working the fields. Following my bio-dynamic Guru's Rudolf Steiner and Mathias Thun, I also chose the day in accordance with the moon. This is how this works: The moon stays in each sign between one and four days. You need to check the ephemerides http://www.astro.com/) to know for sure where the moon is on any particular day. When hives are worked on days when the moon is in gemini, libra or aquarius, the colonies tend to increase brood functions and pollen collection. On those days the bees are calm, they tend to stay on the board without running about nervously, resulting in above average honey harvest. When the moon is in cancer, scorpio, or pieces, the colonies do not want to be disturbed at all. They are most aggressive on those days. On those days the bees are very nervous, resulting in poor honey harvest. When hives are worked on days when the moon is in aries, leo, or sagitarius, the colonies tend to increase pollen collection, potentially neglecting the brood. On those days the bees are calm, resulting in above highest honey harvest. When the moon is in taurus, virgo, or capricorn, working the hive will increase building. 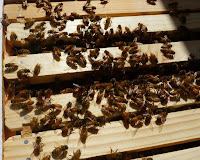 The bees are not as calm and docile on those days and honey harvest will be below average. BTW: I installed my hive on a Earth-Root day, which should have resulted in a lot of building, which is probably a good thing for a newly installed colony. Or so I thought. Today, La Luna was in the sign of aries, a Fire-Fruit sign. Bees are supposedly less aggressive on those days, although the general recommendation is to only work the hive on days when the moon is in an air sign, such as gemini, libra or aquarius. I chose today because the next air sign day is 4 days away and I need to check on the queen now. In case she is dead, we need to get a new one before the colony fails. I am kinda nervous and excited about this at the same time. I have NEVER done it before and from what I have read and seen, it is pretty wild: Opening a box where about 10,000 bees are in to see whether one particular bee (the queen) is doing her job. Well, these guys sure did build a lot. A lot of funny looking stuff, too. Even on the wire of the queen cage, which I tried taking out. Of course I dropped it on the floor of the hive. GREAT! That gave me the opportunity to put my entire arm into the hive right smack middle where (seemingly) ALL of the bees were to fish this thing out. Got the queen-cage out. CHECK! Then I checked every single frame. It appeared that many of them cells were built out. So much for hiving on a EARTH-day. They really went building-crazy. She is alive. GOOD. Imagine here a deep sigh of relief. Queens will mate about five days after emerging. Sometimes it takes another week or ten days before they start laying. 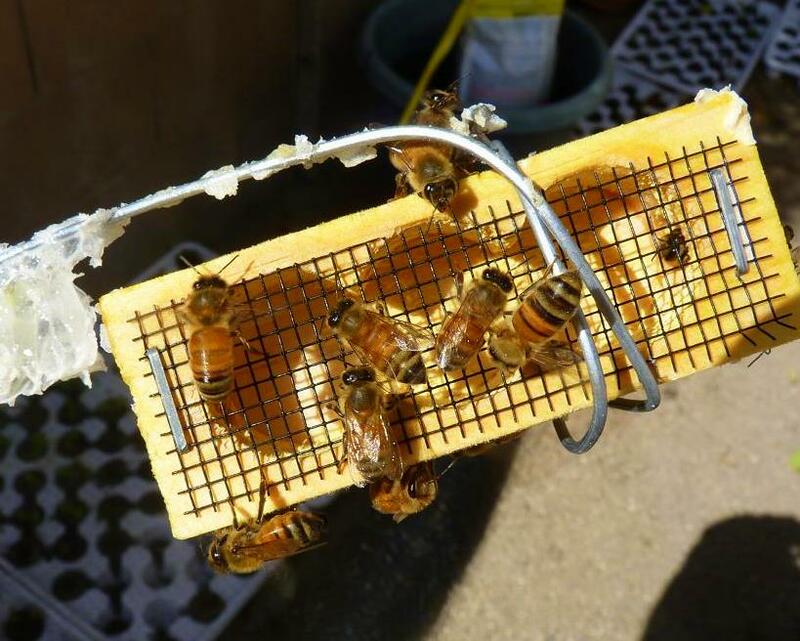 We hived the colony with the queen in the cage. Typically when you buy a NUC with a queen, that queen should be mated. The pros tell me that there is only one proof that the colony has a good queen and that is eggs. While it is generally advised not to disturb them too often (reco is to only check every three weeks), I may have to check them again on the next AIR-BLOSSOM day, which is on Wednesday and Thursday, to make sure our queen infact is laying eggs. Hopefully on that check everything will be fine. Wanna bee in the know?